Following is an article by Zeninjor Enwemeka in the Boston Globe of October, 2014, about the groundbreaking ceremony for the skateboard park that Nancy Schön started working towards back in 1995. You can listen to a segment with Nancy Schön in this audio segment. Watch the groundbreaking ceremony video here. BOSTON — Skaters rejoice, it’s finally happening. Nearly two decades after it was first thought up, Boston is getting a public skate park. A groundbreaking ceremony is being held Thursday morning for the Lynch Family Skatepark and organizers expect it to open by this time next year. The $3 million, 40,000-square-foot skaters’ paradise will be located in East Cambridge near North Point Park, underneath ramps to I-93. The park is designed to accommodate skateboarders, BMX riders, rollerbladers, scooter riders and athletes in wheelchairs. The venue will also have seating for spectators and will be able to accomodate community events as well as professional skating competitions. The long-awaited development began as an idea by sculptor Nancy Schön, famous for her “Make Way for Ducklings” sculptures on the Boston Public Garden. Schön wasn’t happy when in 1995 she learned that skaters were using her “Tortoise and Hare” sculptures in Copley Square for practice. But when she spoke to the skaters, she learned they had few places to skate and often faced fines or had their skateboards taken away. “I went down to Copley Square ready to scream and yell at them, which I started to do, and I started talking to them and I discovered that they were just wonderful kids and they were terrific athletes,” Schön said. “So, I thought, ‘I think I really would like to turn this around.’ ” From there Schön began looking to get a skate park built and homed in on the area underneath the Zakim Bridge as a possible location. Renata von Tscharner, who founded the Charles River Conservancy, also had the idea to create a skate park in the Boston area. In 1999, she was teaching seminars in landscape design and also had a young son who liked to skateboard — that’s when she thought of using the space under bridge for a skate park. She started the conservancy in 2000 with the skate park as a signature project. Von Tscharner said Schön reached out to her in 2002 after learning that the conservancy was planning a skate park. It was “a wonderful serendipity” that the two found out about each other’s common interest and joined forces, von Tscharner said. Schön now serves on the advisory board for the conservancy. Since then, the conservancy has been carrying out the arduous project, partnering with the Massachusetts Department of Conservation and Recreation (DCR) and raising funds from private donors. The major hurdle in the years-long process was obtaining a piece of land. The site of the future park was among parcels of land used during the Big Dig that the state had promised to return to public use after the project was completed. In November 2013, Gov. Deval Patrick signed a bill designating the land for the skate park and last summer that land was transferred to DCR, which will operate the park when it opens. From there, the land had to be cleaned up, and organizers worked to develop and get approval for a design that could accommodate people with disabilities and provide transportation access to I-93. The project also required major funding. The Lynch Family Foundation, for which the park is named, and Vans, a shoe and skateboard apparel company, were the two key donors for the project. The Lynch Family Foundation was an early supporter and donated $800,000 to the project. In July, Vans gave the project a $1.5 million boost and committed to paying $25,000 to DCR each year for the next seven years to maintain the skate park. Vans also plans to host two large- scale professional-level events at the skate park each year. In all, $4.5 million has been raised for the project, with about $1.5 million already spent, according to Charles River Conservancy spokeswoman S.J. Port. The remaining $3 million will go into construction. Though Thursday’s event marks a milestone in the creation of a local skate park, construction won’t actually begin until after winter. Organizers said they have to wait until the ground thaws before they build. They hope to begin pouring concrete in early spring (March or April) and said it will take six months from that point to complete the skate park. “Unless we have a really awful winter, we will be skating on the skate park before this time next year,” Port said. When the park opens, skaters can expect to find a variety features for all skill levels. More than 400 local skaters and skateboarding professionals gave their input on the design of the skate park, which is being done by the architecture and design firm Stantec and landscape architecture firm Halvorson Design Partnership, Inc. 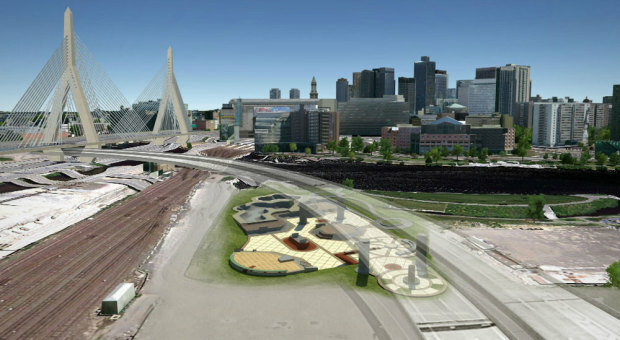 The design will include replicas of popular skating areas around Boston. The skate park will also have some green elements, including recycled building materials. Schön said her “Tortoise and Hare” sculptures will also be incorporated into the skate park, in the form of two large etchings of the sculptures in cement. “It speaks to the history of how the skate park really happened, it happened around the ‘Tortoise and Hare,’ and here it will be etched in cement at the entrance of the park, so that is really exciting,” Schön said. Once the park is completed, it will be free and open to the public year-round. According to DCR, the park hours will be from dawn until dusk, though there are discussions about possibly adding lighting to the facility so that it can be used later in the evenings.